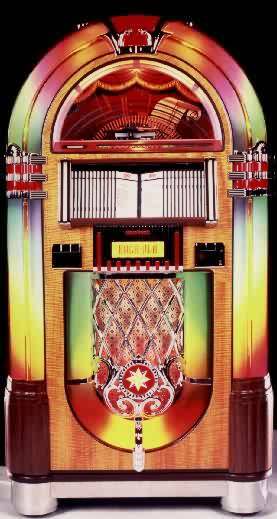 The most popular jukebox of all time has been reproduced in the SyberSonic Bubbler Series. Bubbles of air perk merrily to the top of the 8 bubble tubes, while a kaleidoscope of color flows through the translucent columns and arch. It's the 50's all over again when the 100 CD changer flips the disc right down in front of you. All 19 metal pieces are genuine die cast metal, triple plated with copper, nickel and highly polished chrome. With quality and craftsmanship in mind, only the finest hardwoods adorn this timeless classic. The handcrafted quality of this beauty is a tradition we proudly continue.